Uncle Leo was one of the greatest thinkers in the history of mankind, and he has dipped his fingers in a range of disciplines including science and art. Well, you can now own a piece of Leonardo’s work in the form of the Da Vinci’s Wood Catapult Kit. 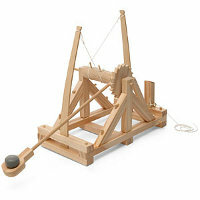 Basically, it allows you to construct your very own catapult based on Da Vinci’s original plans. You need not have any previous experience when it comes to woodwork, since all of the pieces have been precut, drilled and are ready to assemble right out of the box. When primed, it is more than capable of lobbing a lump of clay for more than 14 feet, now how about that? It takes around 1 hour to assemble the entire thing, although your kid might just bug you to do it for him/her under that time frame. You will need some glue and a ruler though, so get those ready beforehand. The Da Vinci’s Wood Catapult Kit will cost you $19.99. Was Da Vinci really your uncle? He is one of my favorite masters.